Today’s newsletter is Part 2 of a two-part series clarifying the question of why DITI may sometimes “miss” a tumor. We began this discussion in our February 2016 newsletter. To read this newsletter entitled: Understanding Breast DITI – Part 1, you may click here (http://phs-thermography.blogspot.com). Again, we strive to convey accurate and reliable information regarding what thermography can detect and how it is best utilized as a tool for monitoring breast health. In this edition, we address some of the Frequently Asked Questions. If a tumor is not active, dormant, or not exhibiting any temperature differentials does that mean it's not significant and I won't need to do anything? Cancer is unpredictable and it wouldn't be prudent to make such a far-reaching assumption. The truth is we don't know that it isn't significant. We encourage you to talk to a medical practitioner about what options there are regarding this finding. There has been a lot in the news about Stage 0 (DCIS) breast cancer not actually being a malignancy, can DITI see this type of breast cancer? 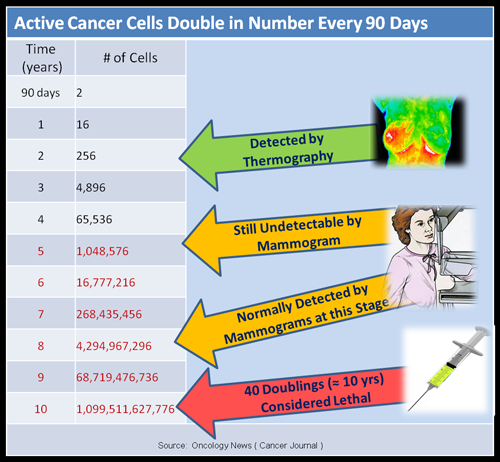 We actually have written about this research finding in another edition of our newsletter titled: The Dilemma of Stage 0 - DCIS. (http://phs-thermography.blogspot.com) and we understand the concern about this type of finding. DCIS, ductal carcinoma in situ is a small pileup of abnormal cells in the lining of the milk duct. You cannot feel it because there is nothing to be felt; there is no lump. But the cells can be seen in a mammogram, and when a pathologist examines them, they can look like cancer cells. The cells have not broken free of the milk duct or invaded the breast. And they may never break free. The lesion might go away on its own or it might invade the breast or spread throughout the body. That raises questions about what, if anything, to do about it. Can I have a thermogram every other year? Ultimately, it's your responsibility to look at all the data, talk to your doctor and decide what the best plan is for you. See chart below. Screening thermography has the opportunity to detect changes at any stage in the development from the first year through to when a tumor is dense enough to be seen with mammography. Ideally, if change is detected it’s best to work with your doctor to evaluate this and make clinical recommendations and possibly prescribe other diagnostic testing.